Starr feels mail is a "waste of paper"
"Don't bother me. Well, not on paper"
Ex-Beatle Ringo Starr has issued a response to the outcry following his recent video message in which he asked fans to stop sending him mail to autograph. In the video posted on his website, Starr somewhat angrily said, "This is a serious message to everybody watching. I want to tell you that after the 20th of October please do not send any fanmail to any address you have. If that is the date on the envelope, it's gonna be tossed. "I'm warning you with peace and love, I have too much to do. So no more fanmail. Thank you. No more objects to be signed. Nothing." The video was roundly lambasted by people who deemed Starr as unappreciative of his fans. According to Rolling Stone, Starr is now backtracking a bit, saying that the ban on fanmail was "in direct response to an inordinate amount of items which have recently appeared for sale on eBay, and to those that repeatedly send cards and items to be signed." Starr also went on to say that the fanmail was "a waste of paper and we all should be mindful of our carbon footprint" - apparently meaning that fan e-mail is another matter altogether. Starr added that his video message wasn't intended as a dig at his "real fans" who realize that he "has always signed items and is in fact the only Beatle to have been doing so. How amazed am I to the reaction to my video update. I hope this statement gets as much. Please read this in a mellow way. 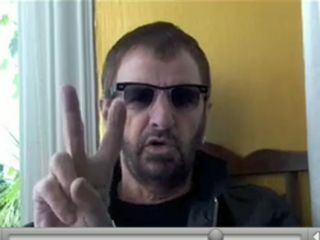 Peace and love, Ringo." Well, glad he's cleared that up. Now, if you'll excuse us, MusicRadar has some serious e-mails to send to Mr. Ringo Starr. By the way, Ringo, what's your address again?